The Kigacon 2018 convention schedule is live! I repeat, the convention schedule is live! Save our link for live updates, and be sure to look at the bottom tabs -- there are ones for each day, with and without descriptions, for easy download. 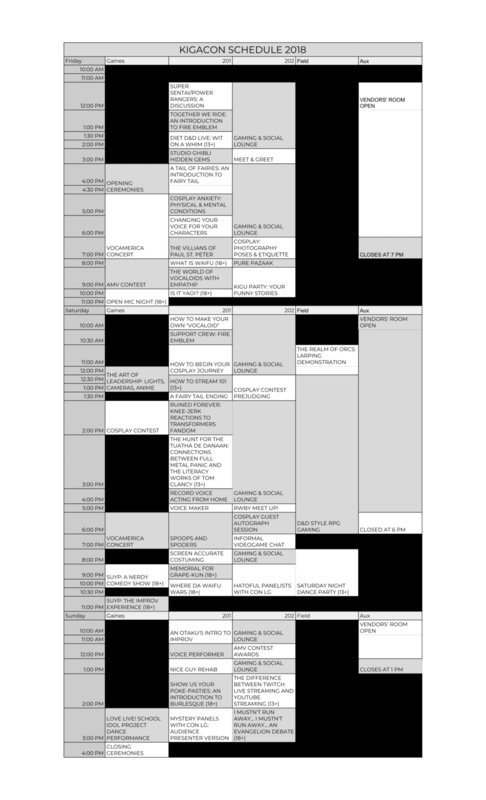 If you're having trouble viewing the page, try downloading our schedule as a portrait-oriented PDF! For more details, visit our "Schedule" tab under CON OVERVIEW. Newer PostTHANK YOU FOR A SUPER KIGACON 2018! Older PostEXTENDED 2018 ONLINE REGISTRATION, CONTEST SUBMISSIONS, SCHEDULE, AND MORE!